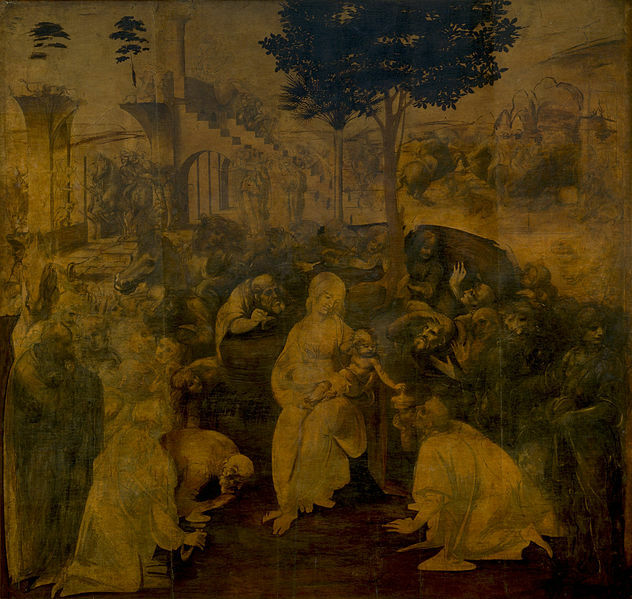 Another unfinished Leonardo da Vinci painting is Adoration of the Magi painted with oil on 246 x 243 cm wood panel sometime between 1481 and 1483. The painting was commissioned as an altarpiece by the San Donato a Scopeto Monastery near Florence, Italy in 1481. Leonardo da Vinci left the painting unfinished at some time before 1483 when he went to Milan for the security of a regular income promised by the Duke of Milan. The painting depicts Mary and the child Jesus sitting. Surrounding Mary and the child Jesus are a number of men and women with ambiguous identities and the Tree of Life illustrated at the back. The whole theme of the painting is about the three wise men worshipping the infant Jesus. The rocky landscape is illustrated with the background portraying the ruins of the palace of King David and combating knights on horseback as an allusion to the decline of paganism and the coming of Christianity. The technique done by da Vinci in this painting tuned out to be a mark in the evolution of art in the way the figures are represented in the painting. The scene shows dynamic movements from the figures and actions surrounding Mary and the child Jesus, who are painted clearly as the center piece. Another technique shown in the painting is a painting method called chiaroscuro where there is a contrast of light and dark shades increase as a figure is painted closer to the ground. Preceding Leonardo da Vinci’s Adoration of the Magi is a work of the same name by Gentile da Fabriano in 1423 and another one in 1455 by Filippo Lippi. Filippi Lippi’s Adoration of the Magi sits in the National Gallery of Art in Washington D.C. The painting of da Vinci now resides in the Uffizi Gallery in Florence, Italy together with the version of da Fabriano.